Recent analysis by the team at DataLight Lab indicate that US Crypto traders are the most active across 4 exchanges out of the 5 that were researched for the study. 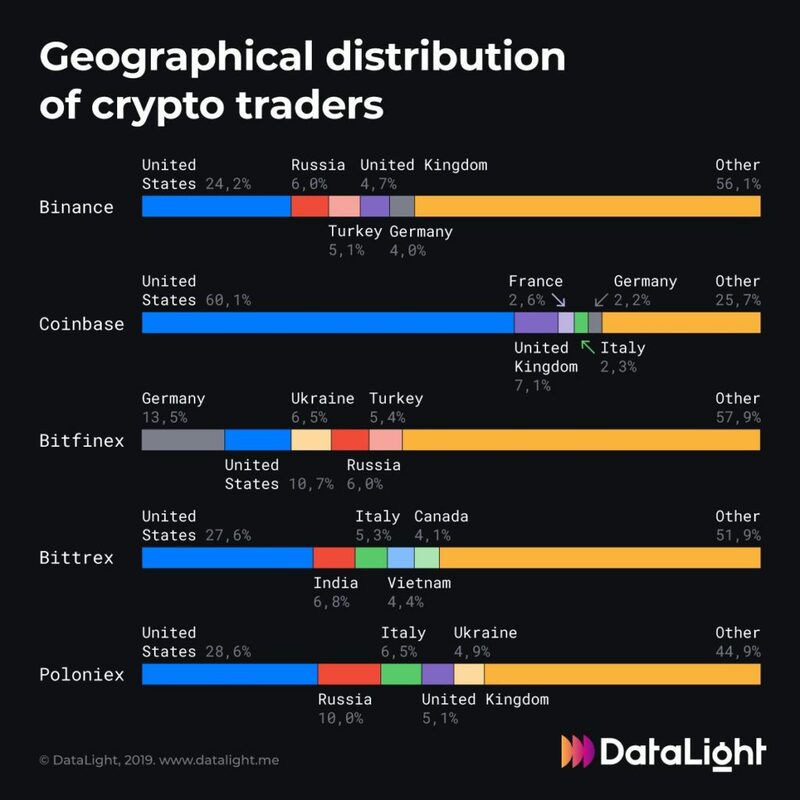 The analysis involved the geographical distribution of traders across the 5 popular exchanges of Binance, Coinbase, Bitfinex, Bittrex and Poloniex. It is only on Bitfinex that American traders did not make up a majority of users at the exchange. A brief summary of the the findings on the trading activities of US crypto traders can be found below. The full infographic by Data Light can be found below and courtesy of their twitter page. One is tempted to conclude that the analysis was not complete in that it did not take into account the number of crypto traders in the countries of Japan, Taiwan, Australia, China and its special administrative region of Hong Kong. If we assume that majority of the traders in Asia are in the ‘Other’ category, then we can connect the dots by first giving a clearer image of their presence in the 5 crypto exchanges mentioned. Factoring in the previous theory that Bitcoin and crypto trade volume will be affected by today’s Chinese New Year celebrations as well as the Spring Festival festivities that extend up until the 19th of this month, then we can be forgiven for concluding that Asia, and particularly China, still has many active crypto traders. Their absence can be felt by the lack of ‘trading action’ in the crypto markets since the New Year celebrations began on the 28th of January. DataLight is a unique online tool that allows crypto traders to better analyze the behavior of their favorite digital assets. The information and analysis available on DataLight allows traders to make precise data-driven trading decisions. The service was launched on the 29th of December last year and is free and open for any trader or crypto enthusiasts with an interest in data analysis around the crypto markets. 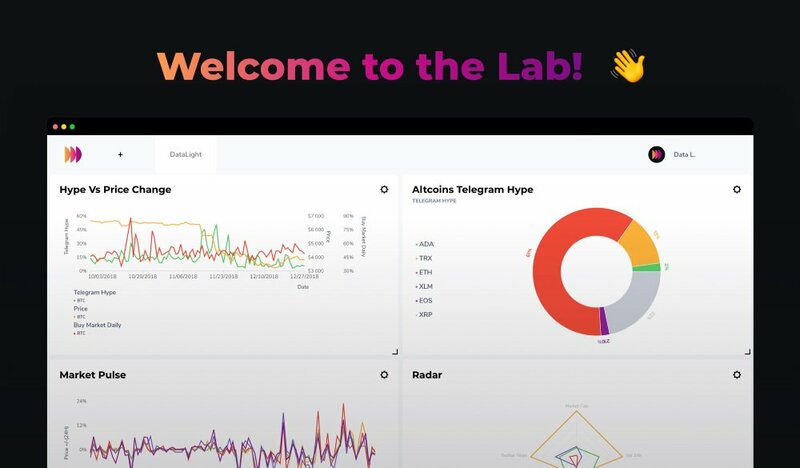 On DataLight, market data, social media activity, blockchain data and many other metrics are visualized on a customizable dashboard available to all users. What are your thoughts on the findings by Data Light that US Crypto traders make up a vast majority of users in the four exchanges of Binance, Coinbase, Bittrex and Poloniex? Did you also formulate a similar theory that traders in Asia, and particularly China, could be part of the ‘Other’ category? Please let us know in the comment section below. Disclaimer: This article is not meant to give financial advice. Any additional opinion herein is purely the author’s and does not represent the opinion of Ethereum World News or any of its other writers. Please carry out your own research before investing in any of the numerous cryptocurrencies available. Thank you. © 2018 Ethereum World News. Choose from the best online casinos in Canada and enjoy the fun!